Migraines can be a debilitating health problem, triggered by a variety of factors from sleep habits, to diet, to the weather. Many sufferers claim they seem to become more prone to migraines at certain times of year –during the changing seasons, or in the spring and summer when they may also be plagued with seasonal allergies. The frustrating thing about migraine sufferers is that many don’t take the time to seriously consider all of their options for prevention and symptom relief. It’s definitely worthwhile to explore natural therapies as a means of better understanding, minimizing, and preventing your migraines, not to mention nixing the dependency on potentially harmful medications often used to manage symptoms. Here are just some of the therapies that migraine sufferers frequently respond to. Many headaches and migraines start in your spine. When your body is misaligned your nerves get very irritated, and communicate quickly with your brain. For some clients, spinal adjustments are an effective way to reduce the pressure on those unhappy nerves. Chiropractic care also helps restore mobility to patients who experience consistent and debilitating muscle tension. Blood flow to and from the brain may also be restricted when muscles are tight in the base of the skull, which can contribute to headache and migraine symptoms. The cumulative effects of rigidity and restriction can lead to severe headaches – so it’s important to target the problem at its source, rather than just treating the resulting migraine. Consider your posture, alignment, and date of your last adjustment. Could a poorly aligned spine, stressed nerves or strained muscles be an underlying cause of your migraine? A chiropractic consultation can help you find out! Seeing a massage therapist isn’t a luxury- for many it’s a highly effective treatment option. 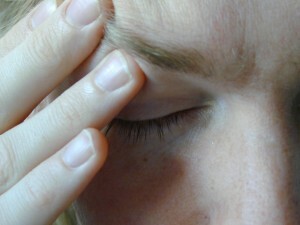 Headaches frequently result from tension and stress, which are manually targeted during a massage session. Your therapist will also help to improve circulation throughout your body, which can draw blood away from the head, reducing pressure that contributes to headache. It’s also incredible to see the effects of loosening and treating muscle tissue. If you have a muscle injury, chances are you’ve been carrying yourself differently. An adjusted or irregular posture of any kind can cause soreness, stiffness, dizziness and headaches. So give massage therapy a try –the combination of targeted manual therapy and the valuable opportunity to reduce stress might be just what you need to manage or minimize migraines. Food sensitivity and allergies might also be causing your migraines. A holistic health practitioner can help you begin an elimination diet or food diary to uncover patterns in your eating that might cause headaches. Many sufferers of migraines know which foods they need to avoid in order to help prevent a killer headache. Don’t worry- this isn’t arbitrary. A nutritionist or ND can help you identify which ingredients are giving you grief- whether it’s a popular additive like MSG, or a less widely identified substance like tyramine. Tyramine, which is found in aged cheese, processed meat, canned soups and several other foods, has been known to trigger migraines in certain individuals. Without some health counselling however, you might never identify something like this as a potential source of your suffering. It’s worth looking into- The sooner you know your problem foods, the sooner you can begin adjusting your diet and lifestyle so you can enjoy more long-term management of your migraines.